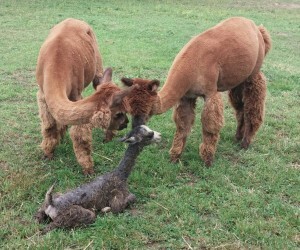 We have been anxiously awaiting the births of our spring crias. 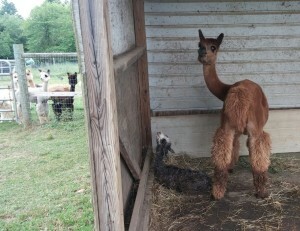 This morning, June 22, we greeted our newest farm member, Windy Darling. Named in recognition of our windy weather this week, and one of our favorite stories. Windy’s mother Natasha Brown usually meets us at the gate each morning, and was not there when we arrived at about 8:30. I walked out to look in the shed, and there was Natasha alternating between eating and humming to and touching her new cria who was cushed next to her. Windy Darling is the full sibling to our handsome Groucho Marx, born last year, and she has the same wonderful black eyebrows and lovely gray fleece. 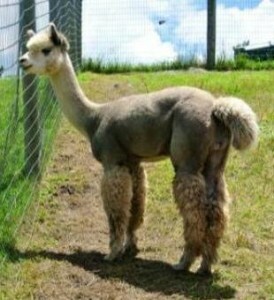 Their sire is the beautiful and fine fleeced Andean Silver. 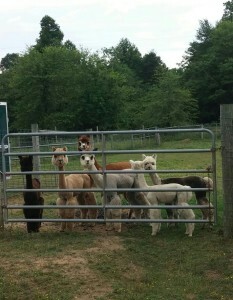 Groucho and all the little juvenile boys were quite fascinated with the newest alpaca on the farm as they got their first look at her. Windy and Natasha are in the front pasture by the store with June Delight who is due later this month, and you are welcome to come by and see them.